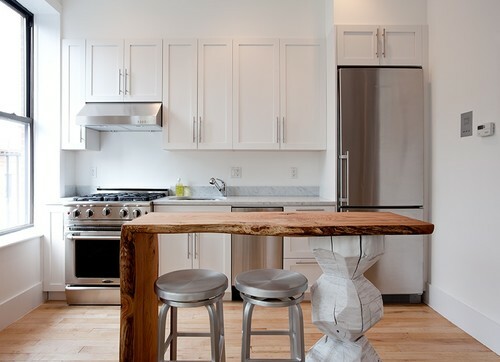 A renovated studio apartment in Brooklyn, New York is this week's Living Large In Small Spaces feature. 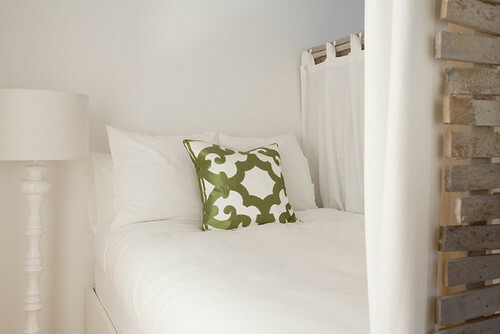 This light and airy space is filled with innovative ideas that make interesting use of its 400 square feet. 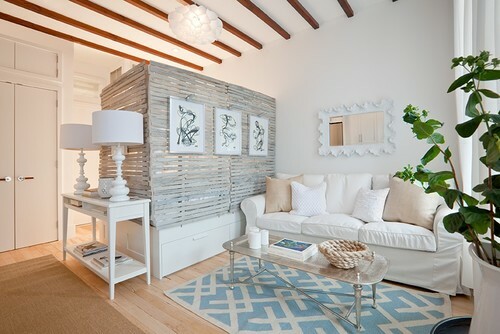 Reclaimed ceiling beams and maple floors bring warmth to the space. 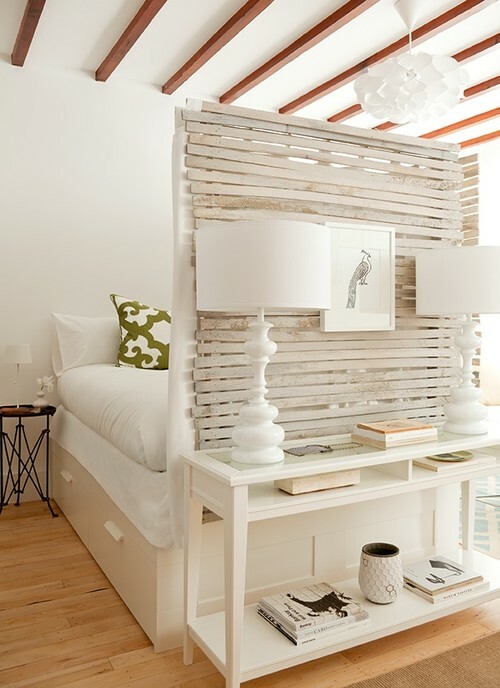 Lath panels were used to create a bedroom nook. New lath was coated with a mix of water-thinned white primer and a little gray paint to give it an aged appearance. An Ikea bed with large storage drawers acts as a base for the lath panels. The lath panels are a clever solution in that as well as giving privacy they add texture, interest, and allow filtered light to flow into the nook. The nook's placement created an entry area for the apartment. Very cozy. White on white gives the illusion of space. This studio apartment is bright and crisp. The unique kitchen island was handmade. A log was sculpted into a spool shape with a chainsaw and finished with grinding and sanding. Then white lacquer was applied and allowed to soak into the wood. Finally, the island was assembled from the spool and two pieces of live-edge cherrywood. The kitchen has full-size appliances, and with the addition of the island the prep space is adequate. 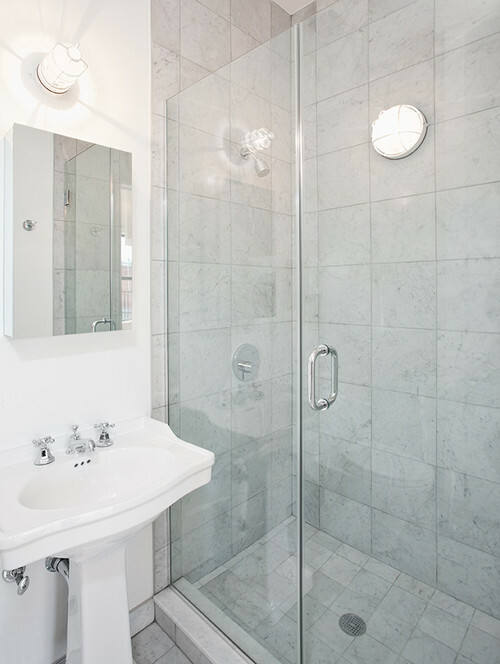 Enclosing the shower with glass is a smart idea in a small bathroom. This is a nice space for a single person. There are some design elements of this studio that I, personally, would change. I won't tell you what they are, but feel free to guess or add your own critique of the space. For more details and information about this space see the Houzz article here. I like this one, Nancy. It's a lovely mix of rustic and urban all at once. The white on white gives it a super fresh and open look. I realize this apartment is staged, but I would need a few more personal items and a few more items on the wall, something about the bed, maybe a few plates about the cabinets. I would also prefer a vanity in the bathroom. The pedestal is so pretty, but I'd need more storage. I'm not sure what you would change, but I would definitely add some red, too. Just a little bit anyway... ;) Hugs! These people know how to live in a small space and make it incredible. I love how they worked a bedroom into the space and that island brings in a country feel that I'm sure is a blessing when coming home from being in the busy urban environment. No hustle and bustle of the city inside this relaxing space. Genus! I like how the bedroom is designed. Very fun idea. I would like a few more built in bookshelves. I noticed the storage space under the bed, too. Great idea! Very nice and the privacy for the bed is a unique idea. Having had friends and a family member living in small square foot NYC rentals I could indentify with this Brooklyn studio. I especially liked the bedroom nook set off with a bit of privacy in the white linens and draped areas giving a feeling of space. The lath wall I thought was wonderful, almost an art piece feel. I liked the kitchen although I would have chosen something else for the island. I think the small 400 sq ft area would work better with the kitchen island matching more of the kitchen wall. Keep the stools, liked them, but I felt the heavy wood island was bit much. Fun to take a look and give my own input. Another great space Nancy . . .teeny tiny. Love this space. For only having 400 sq. feet they used the spaces so well. Love the white of course! I love the wood features such as the reclaimed wood and the beams! 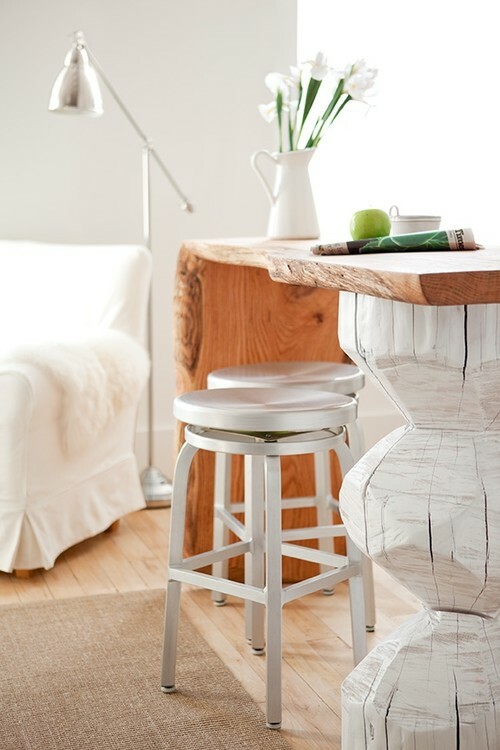 White and wood are an excellent match and what a cozy spot for one person, indeed! Happy Sunday, Nancy! I love this space! It is perfect for a single person with no pets or kids! I would just add a bit more color here and there! 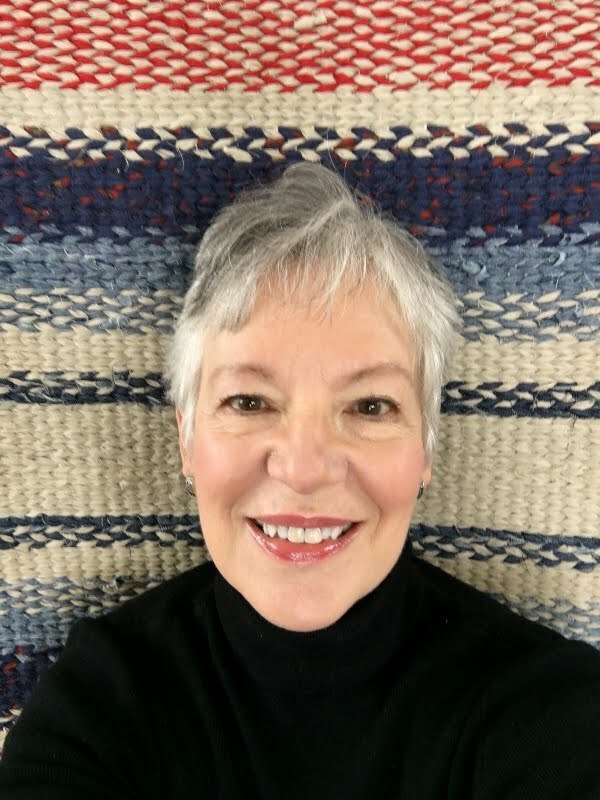 I learn a lot from "Living Large In Small Spaces", series. First of all, you CAN live in small spaces, comfortably. Secondly, declutter and downsize, you don't need things and it looks so much better. 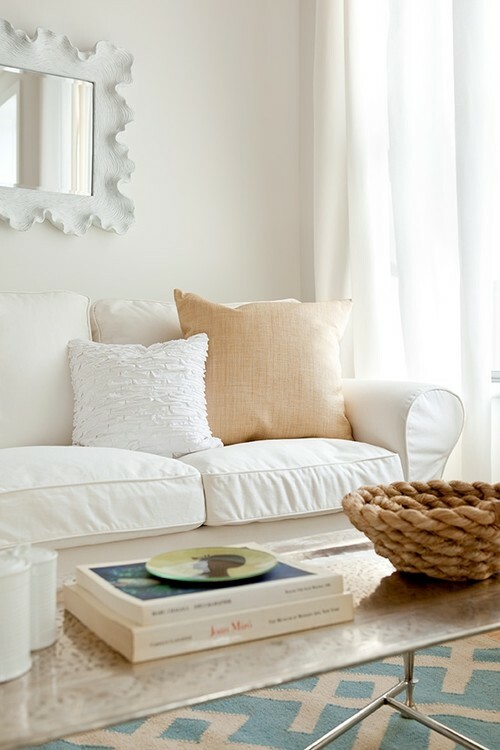 Thirdly, using a plain palette or tone on tone, gives you the feeling of space. Personally, I would definitely add some color! I am not a big fan of white on white, but each person has their own opinions. :) Thank you for another wonderful post, sweet friend. :) God bless you! 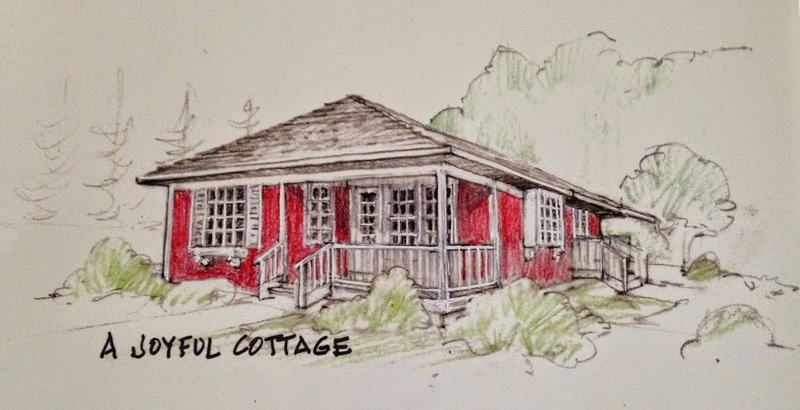 A Joyful Cottage Online Shop Is Open!